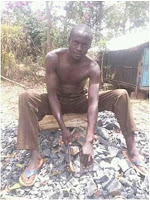 Wednesday, March 27, 2019 - A Recce squad officer, who was once attached to President Uhuru Kenyatta’s security team, now works in a quarry in Kericho. 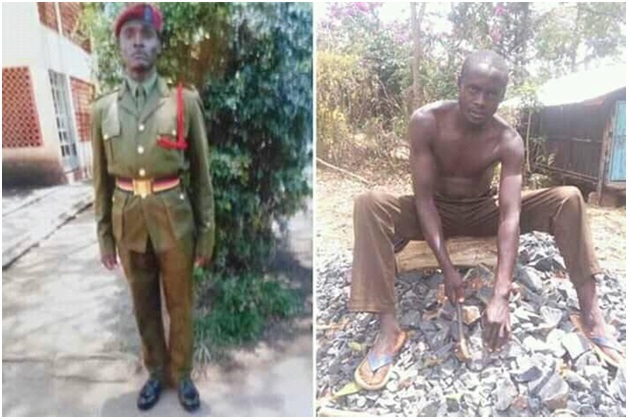 28 year old Nicholas Lagat was suspended from the disciplined forces in 2016 after he delayed to return to work. He had travelled to the village to visit his sick wife. Lagat says his suspension letter was sent to Ainamoi Police Station in Kericho. His wife died the same year after succumbing to throat cancer and he was left to take care of their two year old daughter. He sunk into depression and became an alcoholic. Speaking in an interview with a local daily, the former Recce Squad officer said that two years of drinking destroyed his life and he is in deep mess. “I have gone through hell due to drinking and I feel that I’m tired of this life. I would love to go back to my normal life and get back my job if possible,” he said. He survives by doing odd jobs like digging pit latrines and crushing stones in quarries. This photo shows how the former Recce Squad officer fell from grace to grass.